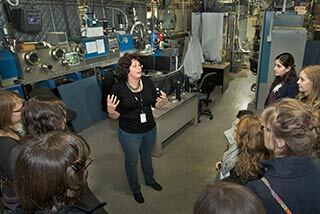 Brookhaven Lab biophysicist Annie Heroux with students in the National Synchrotron Light Source. 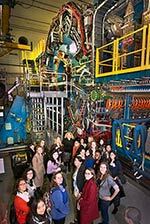 Stony Brook University and Brookhaven National Laboratory recently hosted some of the brightest and most curious young women in the country for a conference on careers in physics. 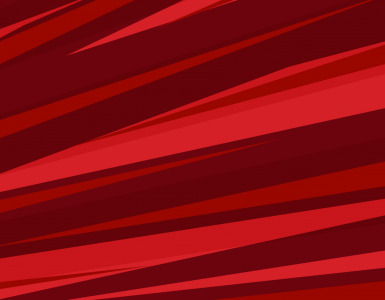 From Jan. 16-19, some 99 undergraduate physics majors participated in the 2014 East Coast Conference for Undergraduate Women in Physics, meeting peers and women of all ages with whom they could share experiences, advice, and ideas. 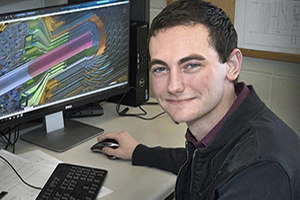 The three-day regional conference, hosted on the campuses of both Brookhaven Lab and Stony Brook University, provided a rare opportunity to get first-hand accounts of the entire physics career path, from graduate school to working at some of the most advanced research facilities in the world. 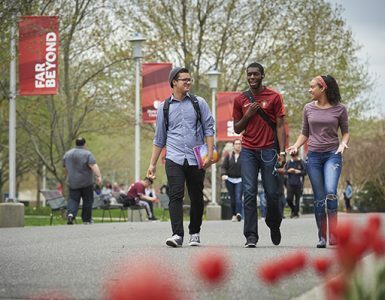 Highlights from the conference—organized by Stony Brook’s Abhay Deshpande and Brookhaven’s Noel Blackburn—included tours of the Lab’s Relativistic Heavy Ion Collider and National Synchrotron Light Source II, poster sessions, and expert presentations ranging from the quest for the Higgs boson to the link between physics and finance. The nationwide Conferences for Undergraduate Women in Physics are supported by the U.S. Department of Energy’s Office of Science, the National Science Foundation, and the American Physical Society.